Cleaning women in India have a lot to put up with. The pay is low and there is little awareness of workers’ rights. But the women in a trade union in Mumbai know how to defend themselves. Most of the women who take up employment in a city like Mumbai can be seen cleaning, cooking or shopping. The need for domestic help in India’s commercial hub is enormous – more so in a labour market where the pay is usually low but the competition that much greater because of the steady influx of people into the city. Many women who work in middle- and upper-class households find themselves facing exploitation, low wages and discrimination. Yet particularly for rural women who have come to the city, domestic work is often the start of their – albeit modest – economic advancement. Only an income of their own in the city guarantees these women workers some degree of social acceptance which, in a traditional country like India, they are usually denied in their villages. ‘I come from a very poor family, but being a domestic worker has helped me a great deal. Not just because of the money. I have also noticed that it helps you earn more respect. 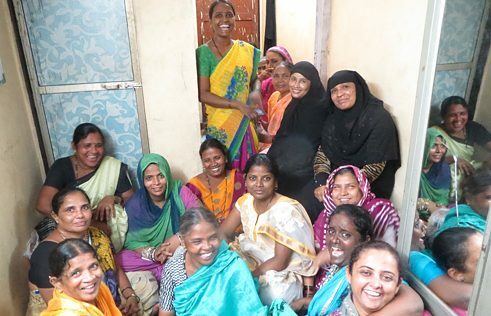 Even my in-laws accepted me at some point,’ says Fatima, a 37-year-old Muslim woman from Dharavi, who worked as a cleaning woman for many years in the city but today works primarily for the Labour Education and Research Network (LEARN). The non-governmental organisation and trade union based in Mumbai, mobilises men and women working in the unorganised sector in the urban slums of the state of Maharashtra. Their target group includes cleaning women, homeworkers and women working in small factories, in addition to street vendors and ragpickers. Fatima and her colleagues are among the organisation’s most active members. Working together in a trade union is a good opportunity for many women to develop self-confidence and to fight against unfair treatment. ‘Some people think we are weak and lack the courage to defend ourselves because we come from rural areas and most of us can neither read nor write. In the past, even I dared not open my mouth, but that has changed. I have learned over the years. At first I only spoke up on minor matters, but with time I have also learned to address larger issues,’ says Sheela, a 43-year-old woman who has been an active trade union member for many years and goes regularly from door to door in Dharavi, Mumbai’s largest slum, to recruit new members. The mother of two daughters has absolutely no doubt that this self-confidence is sorely needed in her career: ‘We domestic workers are rarely given the respect we deserve. We are often yelled at. Some employers even grudge us a cup of tea. Yet there are also families who have separate cups for us which they themselves would never touch. That is even more insulting that no tea at all. I also know women who are cheated of their money,’ she says. Besides such cases, many domestic workers in a multi-ethnic city like Mumbai also face discrimination due to cultural and religious prejudice. Employers from Brahmin families, for instance, are sometimes uncomfortable in the presence of menstruating women and would rather send them home. Employers with a Hindu or Christian background may not want to employ Muslims because they are afraid they could be terrorists. However, there are also reservations the other way around: some Muslim women are reluctant to work in a Christian household because they fear they may find pork in the refrigerator.